Mac and Cheese That’s High-Protein AND Vegan?! Sign Us Up Right Now! When I think of protein, pasta is the last thing that comes to mind; after all, it’s carbs. But Modern Table is known for its gluten-free hearty noodles made with a blend of lentils, rice, and pea protein. “Everyone loves pasta, but it’s not exactly good for you,” the company explains on its website. “We wanted to make pasta that tastes good, but packs in nutritional value.” Now, it launched a new line of vegan mac and cheese with 16 grams of protein per serving. Three flavors have hit Whole Foods nationwide this month: Southwest, Classic Cheddar Style, and White Cheddar Style. Each carton retails for $4. A Modern Table spokesperson told POPSUGAR, “Some of our most loyal customers are vegan, and many others think of themselves as flexitarian — looking to eat less meat and dairy. 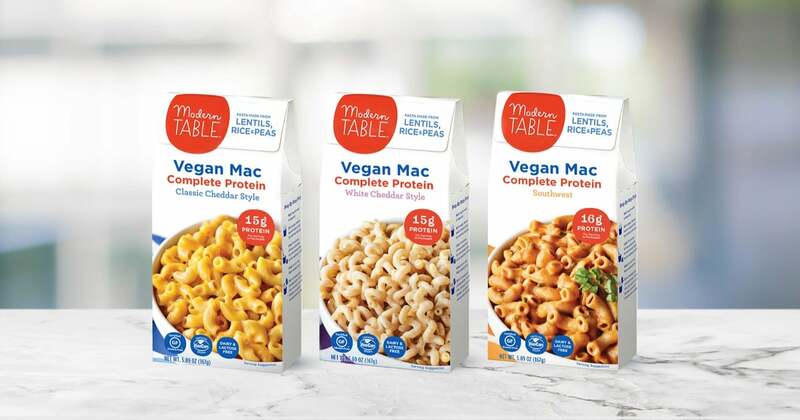 We’re seeing a major push toward foods that simply taste great and also happen to not have dairy or meat in them.” In response, the vegan mac line was born. To top it all off, you can get creative with your mac! Jasmine, a plant-based blogger, told us that she tried the Southwest flavor and detailed on her Instagram feed how she created a vegan Hamburger Helper dish by combining the mac and cheese with Beyond Meat Burgers. The result, she wrote, was “delicious.” Vegan junk food doesn’t actually have to be “junk” — it can fuel you through the day. Note: every carton is labeled with nutritional facts for packaged and prepared mac and cheese. We’re giving you information on protein, fiber, calories, and more for the finished product (once you add milk and butter). Because nobody’s eating dry, uncooked mac!